She knew she shouldn’t approach the derelict old house. Everyone knew it was abandoned–probably haunted too. But Blake Callaghan’s curiosity is just too much, so she scales the wall and wanders through the overgrown, unkempt garden towards the house. You can imagine her surprise when she encounters an old man in the garden; so very old he is. He introduces himself as Mr. Donn and begins to tell Blake stories, wondrous stories of the Sidhe, of changelings, and of the Dullahan. Stories of the brevity of life and the certainty of death that change Blake somehow in the hearing of them. House of the Dead is an incredible novella/short story collection that I would highly recommend to anyone who enjoys fantasy or mythology. It pulls from old Celtic legends, but presents the tales in a fresh, insightful way, uniting the individual stories within Blake’s story and making them part of a greater whole. I first discovered the author through her Merlin fanfics, writing under the pseudonym Emachinescat; they are wonderful, and I fell in love with the author’s writing then. This novella displays the same brilliance, but perhaps even more finely crafted. There is both a richness of imagery and a sparseness of dialogue in this book that is unusual, I think, and I found it oddly moving. There were several times when the stories moved me to the point of chills, and by the end of the novella, I was crying. The perspective on life and death offered here is truly powerful, echoing the Doctor’s idea that “we’re all stories, in the end” and the desire to really live life to the fullest, to write a good story with your life. As I said, highly recommended. All Dinadan really wants to do with his life is be a minstrel, writing great ballads and accompanying himself on his rebec. The chances of actually getting to do that are pretty slim, though, when you’re the disappointing second son of a nobleman knight and the younger brother of a legend. Tristan has never returned to their home in the eight years since he set off to seek his fortune, but the tale of his skill still reach his family and their father never tires of pointing out the differences between his sons. Finally, after being humiliatingly knighted by his drunken father, Dinadan rides off, taking little but his armor and his rebec, to seek his own fortune. For his own part, he would be well-content to ride along incognito, earning his way with his music, but fate seems to have different plans as he continues to get drawn into the affairs (worst of all, the love affairs) of those around him. And worse yet, when he finally does meet his brother Tristan, he finds an arrogant idiot who has somehow managed to get himself ridiculously obsessed with some equally idiotic queen by the name of Iseult–yet another absurd love affair for Dinadan to get dragged into. He’s well on the way to swearing off of love forever! I love, love, love Morris’ Squires Tale books–they’re good for numerous, frequent re-reads and they’re equally engaging and funny every time. Plus, I love the way their insight into human nature often tells me something important about myself as I’m reading. In any case, although The Ballad of Sir Dinadan is technically the fifth volume, the books are only loosely connected, so there’s nothing to be lost by reading this one independently. As I said, the prose is remarkably well-written, insightful and funny both, without taking itself too seriously. Actually, this volume is probably less serious than many of the other volumes, in spite of its roots in the tragedy of Tristan and Iseult. Dinadan’s character is very well developed, and as he is the sort of person to think that this sort of love is rather absurd, we do get a more ridiculous perspective on it than in some stories. It’s actually pretty refreshing, particularly the way in which Dinadan eventually comes to discover that he can have true friendship and love without necessarily having to be “in love” with all the absurdities that entails. I think I’ve mentioned before that an intentional singleness isn’t something books often address, and it’s nice to see an author brave enough to broach the topic. In any case, there’s lots of good fun and adventure outside of Tristan’s story as well, and some incredible character development also. 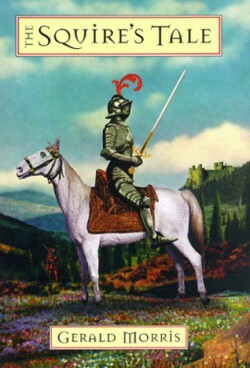 I would highly recommend The Ballad of Sir Dinadan to anyone, say, 15+ who enjoys Arthurian legends and retellings. NOTE: Sorry, I’m doing the reviews of this series out of order. I’ll fill in the gaps soon. But really, with this set, it doesn’t matter what order you read them in. Imagine spending your entire childhood being raised by someone who can see the future as clearly as you see the past and to whom the past is as dim as the future is to you. You can imagine, it would give you a different perspective . . . and cause you to accept that when that person says something’s going to happen, it will. Thus it is that Terence, who has grown up with the unusual hermit Trevisant, doesn’t question the old hermit when young Gawain rides up to their hermitage and Trevisant declares he will one day be a great knight. Nor does Terence argue greatly when the hermit sends him packing to be Gawain’s squire. And thus begins an adventure that will span the reaches of Arthur’s kingdom and beyond . . . and a lifelong friendship, whatever protocol may say about the relations between knights and squires. I love The Squire’s Tale; actually, I couldn’t tell you how many times I’ve read it by now, or how many times I’m likely to read it in the future. This is a book that only gets better the more you read it, although it’s a delight from the first. This book is a refreshing conglomeration of random traditional stories about Sir Gawain, knit together into a single story told from the perspective of Gawain’s squire, Terence. I love what Morris does with the stories–they all work together well and are told with an immense sense of humor and good sense. Moreover, they showcase that which is absolutely best about this story: the characters, especially Gawain and Terence. They’re both just really enjoyable characters to read (and people I’d actually like to meet in real life! )–practical, good-humored, men of character and courage, insightful, and not over-ready to bow to social norms just because they’re the norm. This book is very clean, and would be absolutely appropriate for late elementary and up, but I think The Squire’s Tale will be appreciated by some adults even more than by children; I know I often find insight into who I am and why I do things when I read this book and the others in this series. In any case, if you haven’t read this yet, you should check it out! Village scamp and layabout, young Lukas, finds his life rather upended when a traveling entertainer invites him to participate in the show . . . and somehow sends Lukas straight into another land. In the kingdom of Abadan, shortly after nearly being killed, Lukas is declared king. What better occupation for someone whose deepest dedication is the pursuit of pleasure and the avoidance of any sort of labor! But when the plight of the people of Abadan and its neighboring kingdom attract his attention, Lukas (known there as King Kasha) finds that being a king isn’t all fun and games–in fact, it can be deadly serious. I couldn’t say exactly why, but ever since I first read it, The First Two Lives of Lukas-Kasha has been one of my favorite Lloyd Alexander books. It’s certainly true to his style: bumbling boys who haven’t a clue getting thrown into adventures in which they grow hugely; brave, bright young women who are more than they seem; foolish poets who are wiser than they appear; grand adventure at every turn; humor and irony abundantly available; and lessons to be learned in the most enjoyable way of all–through story. I really enjoy the characters in this book. I think it’s especially nice that Lukas is quite clever–however clueless he may seem–and that he grows so much through his adventures. He’s the sort of character that you really don’t particularly like at the beginning, but he grows on you rather. I think the setting suits the story well also–flavored by the legends of ancient Persia, yet unique to this tale. Plus there’s the mystery of what exactly happened that’s never really explained. And maybe it’s just me, but I really love the dry, sarcastic humor with which Alexander seems to view the world; it contains a lot of wisdom, if you pay attention. I would definitely recommend The First Two Lives of Lukas-Kasha to anyone who likes a good adventure–plus it’s appropriate for late elementary (or at least middle school) and older. It is said that the falling snowflakes are the tears of the snow maidens. But ask a snow maiden, and you might get a different story altogether. In fact, she might tell you stories similar to the ones a young traveler heard when he spoke to a pale, beautiful woman out in the snowy wilderness . . . you might even hear stories to make you weep yourself. I love the way in which Shirahime-Syo is both very unique for CLAMP and is yet quintessentially theirs. This is a single volume of manga containing three short stories that almost resemble folk tales. This feeling is enhanced by the art style which is, again, both extremely CLAMP and yet different from their norm, evoking a more traditional Japanese painting style. It’s very beautiful, haunting almost. The style fits the stories perfectly. All three tales are of old Japan (or somewhere that looks similar), out in the wilds during the deep snows, and in each story, there is an initial impression of a man-versus-nature sort of story. Yet somehow in the midst of that, the stories get turned back upon man, showing that we are our own worst problem. The stories are poignant and beautiful, tragically lovely. I’m sure not everyone would enjoy them, but I truly think all readers would benefit from reading Shirahime-Syo at least once; it’s a moving experience. Taran dreams of a life of heroism, convinced his real life in tiny Caer Dallben is anything but. While daring swordfights spark his imagination, he finds himself Assistant Pigkeeper to an oracular pig who, while quite nice in her own way, has never done anything exciting. Or at least, not until one fateful day when all the creatures in Caer Dallben started acting terrified and ran away . . . a day when the Horned King rode. Chasing after the pig, Hen Wen, into the forest, Taran soon finds himself dragged into an adventure as big as he could have ever hoped . . . only, heroics in truth seem a lot more like hard work, sacrifice, exhaustion, hunger, and conviction than like anything he ever expected. On the course of his journey, Taran meets numerous people who show him what true valor looks like: Prince Gwydion, the lovely Eilonwy, the creature Gurgi, travelling bard (and notorious liar) Fflewddur Fflam, to name a few. In the end, Taran’s whole view of life will change . . . and you never know, he might develop a touch of heroism himself. I love Lloyd Alexander’s writing, and his Prydain books in particular. There’s just something about his matter-of-fact, pragmatic, yet somehow satirical voice that’s both captivating and extremely funny. His plot is exciting, but I must say, it’s the people that stand out, and the things they learn (which are almost always things we need to learn ourselves as well). Gwydion is a true hero–by which I mean he’s a servant who puts others before himself. Gurgi, with all of his crunchings and munchings is quite the enigma, someone you could easily feel sorry for but who’s actually braver and more loyal than most anyone when it comes down to it. And the princess Eilonwy . . . Alexander’s female leads are always impressive and a treat to read, and Eilonwy’s no exception. I admire her strength of character, and I think her metaphorical way of speaking adds both humor and depth to the story. Poor Fflewddur . . . you’d think he’s mostly there for comic effect, but then there are moments when he truly surprises you. It’s a delight to see the characters growing throughout their journey. I LOVE The Book of Three and would highly recommend it to anyone upper elementary to adult. Katie is a perfect picture of someone in a late-twenties slump: stressed, directionless, boyfriend-less. She’s done fairly well as the chef at the restaurant Seconds, but she’s moving on now to owning a restaurant of her own–which should be super-exciting, but the work isn’t moving forward nearly as quickly as she’d like, and right now she’s in a state of limbo. Still living in the apartment on Seconds’ upper floor, still wandering through the restaurant making a pain of herself, but no longer needed, really. Her life takes a turn, though when she discovers she can change the past. . . . After an accident results in Hazel, one of the servers at Seconds, being badly burned, Katie is given the change to prevent that–as she is shown in a dream by the house spirit of Seconds. It’s supposed to be a one-time alteration, but Katie finds a way to get around the rules and soon has made such a mess of time that she doesn’t know what’s going on! I absolutely loved Seconds; I read it in one sitting, even though it’s a pretty thick graphic novel. This story is a zany mix-up of contemporary life, ancient lore, science fiction, etc. The result is quirky, for sure, but also very fun and significantly insightful. I think this graphic novel speaks meaningfully into a slice of life that is often ignored–those people who aren’t quite such young adults anymore, but who are still young enough that they’re not settled yet. This is a significant–often lonely–demographic, yet writers seem to shy away from addressing the needs of this age range, in my experience. Not so here–Katie’s issues are laid out in painful honesty. Katie is really a great character–even depressed, she’s full of life, personality, and enough determination to get the world in trouble. Her arguments with the narrator are the best! I think the art style really fits the story as well. As opposed to, say Sandman or Fables, Seconds is more a cross between manga and American cartoons–the style is actually similar to that used in Foiled. It really suits the story, plus I personally like this style of graphic novel a lot better than the more classic comic-book style. I would recommend Seconds to anyone who likes American graphic novels, but especially to those who are stuck in that awkward late-twenties slump themselves–if only as a reminder that some people have it even worse than you!